Compressed audio gives up so much, I am surprised by the fidelity Nexus 6 gives back. Shocked is better word. I ordered the smartphone from T-Mobile on January 21 and received it the following day. As I will explain in my forthcoming review—tentatively planned as an “I love you” post on BetaNews (and here), Nexus 6 is amazing. I haven’t enjoyed using a handset this much in years. The overall user experience is spectacular. My audio expectations were modest, when first connecting my Grado Labs Rs1e headphones and streaming from Google Music. Soundstage and detail exceed streaming from iTunes to iPhone 6, or—I do not lie—listening to music stored on MacBook Pro SSD. The differences in detail are shockingly apparent. On all three devices, graphic equalizer is not enabled. Someone tell me: Is this video thing part of Google’s new YouTube service—Music Key? 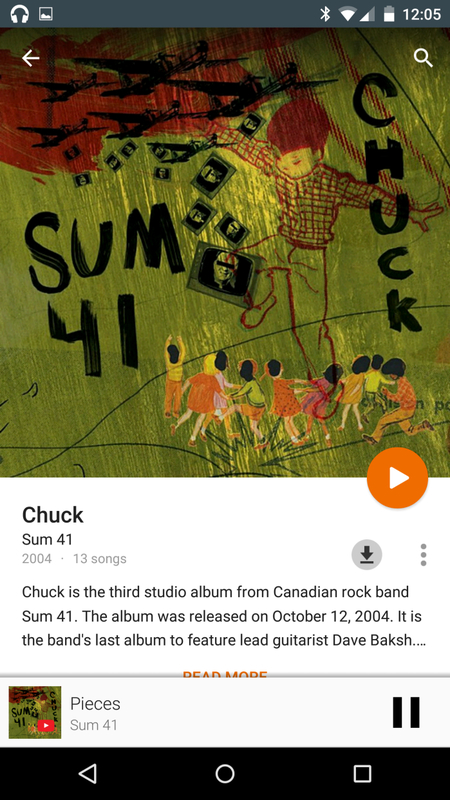 After Sum 41’s “Pieces” plays, for example, Nexus 6 offers to stream the video, and that’s new behavior to me. It’s another benefit derived from tight integration among Google services. This isn’t my first Nexus device. I’ve used them all—One, S, Galaxy, 4, and 5—but none musically delights like this. To exceed Apple, which has been refining music software and devices since 2001, is worthy of note, and it’s a benefit many smartphone buyers will appreciate. But they need to be informed, Advertising the device’s benefits is essential, particularly with iPhone being such the brand and sales juggernaut. Hey, Apple shipped 74.5 smartphones during calendar fourth-quarter 2014—whoa, tying Samsung. Nexus 6 won’t sell itself. Hehe, not that the smartphone is easily purchased. Nexus 6 is perennially out of stock at Google Play or Motorola. During last week’s Q4 earnings call, Google CFO Patrick Pichette admitted: “We had real issues and unable to secure sufficient inventory to meet the demand that we have forecasted”. The 32GB Midnight Blue model is available today from both sites, but only the Cloud White from the Play Store—and neither has the 64 gigger (the one I ordered from T-Mobile). I came to choose Nexus 6 when returning to using Chromebook as my full-time computer. I sought the benefits of Google cloud integration across devices, which while available on iOS isn’t as satisfying. Android 5 Lollipop is much better than expected, for many reasons. But, unquestionably, Google’s Material Design ranks high among them. The skeuomorphic UI approach Apple popularized during the 1980s is an anachronism in 2015. Building on the familiarity of 3D objects made some sense during the early days of PC acceptance but has no useful benefit on websites or devices that use touchscreens; they’re 2D, not 3D. Wrapping up, the overall Nexus 6 user experience is so good, my contention is confirmed: Google chose wrongly by selling Motorola to Lenovo. The integration of hardware, software, and connected services is tight, delivering better contextual consumption experience than iPhone 6. Motorola’s value to Google is, or was, immeasurable from research and product development perspectives. The search and information giant squandered a valuable long-term asset to, presumably, minimize short-term sags on overall financial performance.